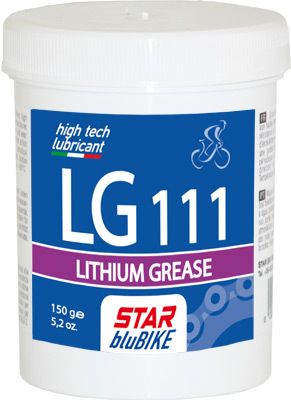 Multi-purpose bike lithium grease with special additives, offers high pressure load resistance and good response at high tempertatures guaranteeing strong water repellent characteristics, corrosion and wear resistance. 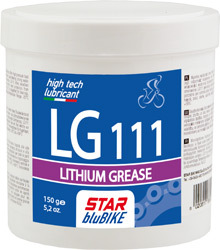 • LG111 offers excellent results for bicycle’s mechanism action parts which need protection from atmospheric agents or for periodical lubrication. • LG111 is suggested for bearings, hubs, headsets, bottom brackets or during assemblage. Consistency: NLGI 2. Temperature Range: -20°C until + 180°C.